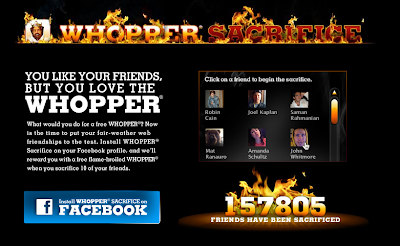 This is the latest campaign by agency CP+B for Whopper. I haven't installed it, so don't know if it just applies to the US, but like the idea and suspect people will have a laugh with it. Install from here. Thanks Aisling for sending on to me. OMG, no, I don't need a whopper that bad! That's really funny! I saw that earlier, but didn't pick up on exactly what it was until I read your post. It will be interesting to see if this works for BurgerKing!